4,246 new CPAs ~ Live. Share. Inspire. It has been my dream to be a Certified Public Accountant and the way to reaching that dream was so steep. I have tasted the bitterness of life and the sweetness of living. Congratulations to 4,246 fresh licensed accountants who are still in cloud9 at this very moment; sure, I feel you. To those to were not able to make it this time, there is a reason and a season for everything. Strive harder, never give up. After all the struggle, and when you get to hold that most coveted 3-letter suffix, the success is sweeter. Every time I scan through the names of the passers, I can't help but feel emotional and proud. I know you gone through all the hardships to make it and you all deserve it. What's more fulfilling? It's when you hastily browse through the pages and you see the name of your student! And you get to see her again, congratulate her and your heart seem to bloat as you hear her say, "Thank you Miss. You taught me how!". Right there and then, you can't explain that rush of emotions and it's overwhelming. Congratulations to Diesy Bail V. Vingno! And to all my other students, I look forward to seeing your names in the next list of passers. We are so proud of you, all of you. 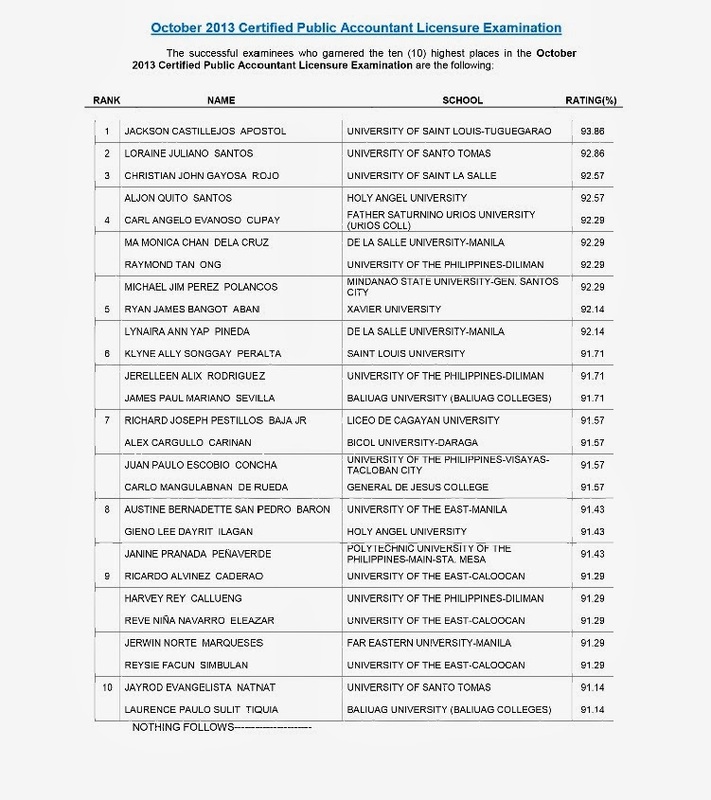 To upload the complete list of October 2013 CPA Board Passers, click here. To see the performance of every schools, download here. Remember, do not let anyone or any circumstance hold you from reaching your dreams. Study hard, pray harder. God has wonderful plans for you.